And then there’s John Smith, 70, of the 8th Illinois who is out of his head most of the time. Smith is so feeble that one of his fellow ex-soldiers has to help him to his cell at night. 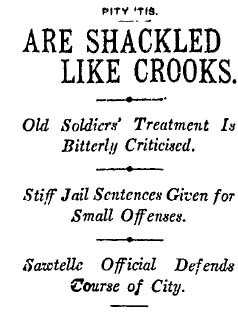 The six old soldiers are serving 10 days in jail for public drunkenness in Sawtelle, the settlement outside the gates of the veterans home, and much to their shame were brought downtown in irons on the streetcar. Smith, Russell and Sullivan freely admit they were drunk on payday, but not causing any trouble. Gorsuch and Sherwood, two former infantrymen, said they were “skylarking” in a harmless scuffle and were jailed because they refused to pay a fine, while Ryan says he was in his room, doing nothing. The men are no trouble. In fact the sheriff and jailer have refused to lock them up, giving them the run of the place as they serve their 10-day sentences. 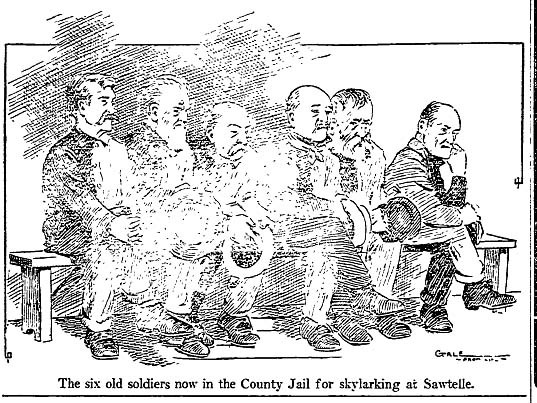 The men say that the Sawtelle constables “lay for us like a pack of wolves” on payday because they get a bonus for each arrest, plus mileage for every prisoner brought to the County Jail. Veterans Home officials counter that drunkenness is an increasingly serious problem and that the old soldiers get around attempts to maintain sobriety by pooling their money and designating one man as a runner to buy liquor wholesale in Santa Monica. Read the previous entry on Ocean Park banning the sale of liquor to soldiers in uniform because of drunk Civil War veterans. This entry was posted in 1907, Civil War, Crime and Courts, Downtown, Food and Drink, LAPD, Streetcars, Transportation and tagged #Civil War, 1907, alcohol, crime and courts, food and drink, jails, Sawtelle, veterans. Bookmark the permalink.